Subject to final availability confirmation by email. Room with a double bed and full shower or bath. The sofa converts to a bed suitable for accommodating a child under the age of 12 years. Open: All year long. Summer season is from April 10 – October 31. Adenya Hotel & Resort stays committed to its promise for a dream vacation surrounded by nature’s magic and luxury to its perfection. Meeting the superlative levels of standard, the resort will make real the idea of a more than an amazing holiday with comfort and excellence of hospitality. 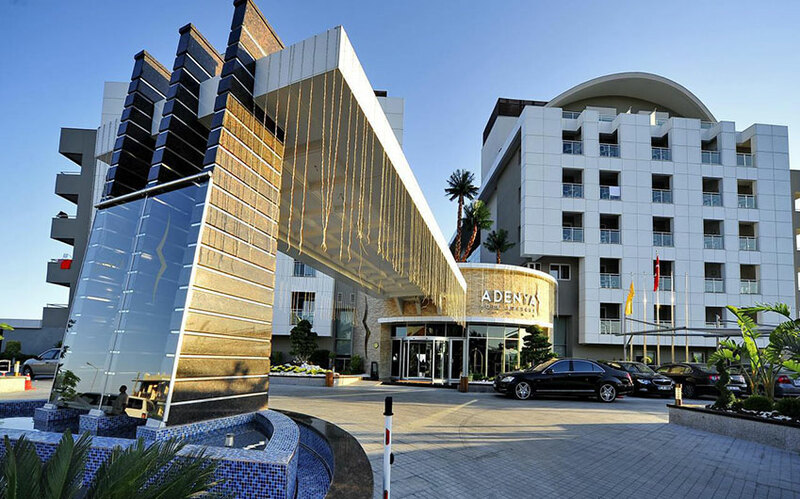 Situated in Alanya, Adenya is a place where you come to unwind and experience the enchanted fusion of the sea and the sun; the magnificence of the Mediterranean Sea; and not to mention the paradise that a resort is. Adenya, standing true to its meaning – Garden of Paradise, opens its gates to let you experience the true definition and sense of alternative tourism merged with alternative service. The warm welcome, brilliant cordiality, acknowledgement of family structure and respect for Islamic values would turn this to an unforgettable holiday experience in Turkey. Unlimited availability of food and drinks from 7am till 12am that includes three main meals – Breakfast, Lunch, Dinner, with snacks served in between meals. Hot and cold beverages are also served throughout the day. Two beach areas out of which one reserved exclusively for women and one stays open for men only. Beach areas stay open from May 1 to October 31. Separate swimming pools are available for men and women – 3 men only pools and 5 women only pools. All these swimming pools are with Jacuzzi & kids pool. Sports and Leisure Activities usually include aqua-aerobics, aerobics, pool table, darts, beach volleyball and table tennis. Separate spa facilities for men and women are available at the resort, which include steam room, sauna, spa, Turkish bath and gym. Other than these, a cloistered pool & hamam is offered to the families. Live folk music, comedy plays, shows, sports and games, poetry etc. add up to make your evenings entertaining and summer season daytime exciting. Children get to enjoy their own pool, kids’ club (for children between 5 -11 years), playroom, high chairs and playground. Other activities for children include bowling, table tennis, animation shows, mini football, etc. The resort has 5 women only pools with kids pool and Jacuzzi. 3 of these pools are with seawater. Outdoor pool has an area of 431 square meters and 1.40 meters depth, also with Jacuzzi, kids pool, sun terrace, water-slides, free sun loungers and parasols. 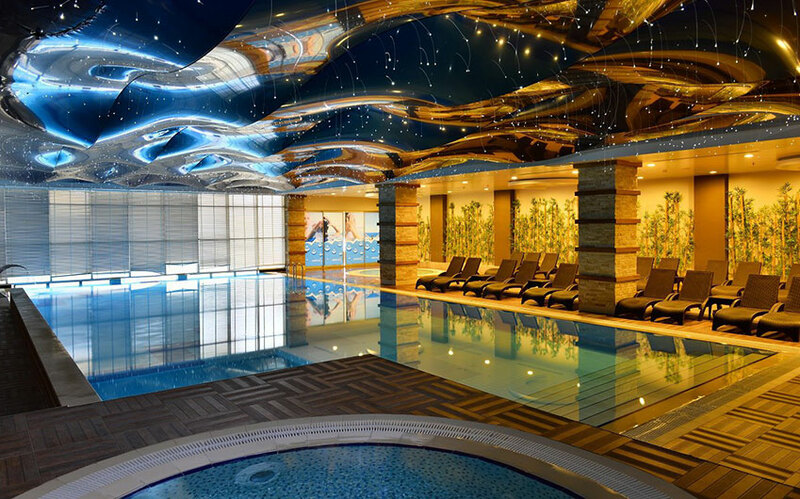 Indoor pool (130 square meter area size and 1.40 meters depth) comes with a heating system, kids pool and Jacuzzi. 3 men only pools come with kids pool and Jacuzzi. 1 of these pools is with seawater. Outdoor pool has an area of 431 square meters and 1.40 meters depth, also with Jacuzzi, kids pool, water-slides, and sun terrace with free sun loungers and parasols. Indoor pool (110 square meters area size and 1.40 meters depth) comes with a Jacuzzi. Decked sunbathing area surrounds the pools. 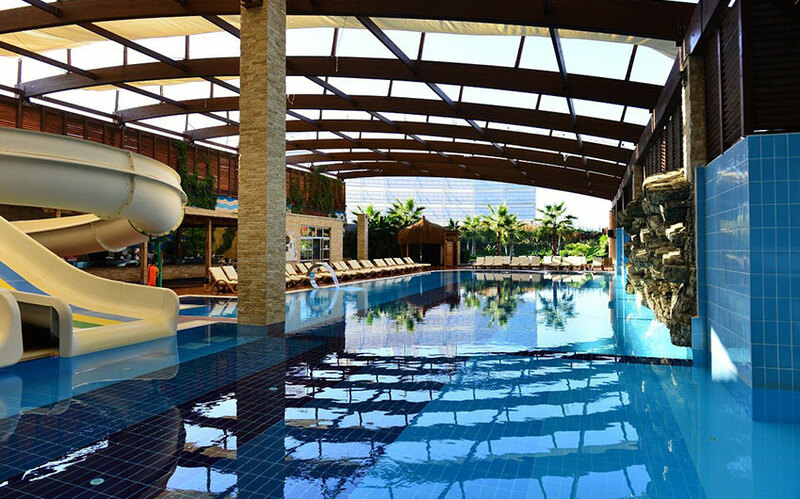 Families can book a mini pool and hamam at an extra charge. A private beach area is designed exclusively for women with special sand from Egypt and a high degree of privacy. However, this does not guarantee 100% privacy from an outside eye in the whole beach since it is an open sea, except for sunbathing area that offers complete privacy from an outside eye. For ease and comfort of women, a private path leads from beach area to women’s pool area. Please note that the beach stays closed during the month of April and there might be some cleaning work and maintenance going on in the beach area. An open beach area for men only is also designed with special sand from Egypt Beach. Huts that oversee the beach area are offered for hire. However, the guests staying in suite rooms can enjoy them for free at any time of the day. Each hut has a small sitting area, 2 sun beds and minibar. The hotel provides the butler service here. Free sun loungers and shades are available. The hotel provides free towels for use on the beach and by the pool. Fully equipped fitness room separate for men and women. One Spa Center for men and one for women that includes steam bath, authentic Turkish bath, sauna and massage rooms. An amphitheater, a concert area that accommodates 600 people and a mini cinema (extra charge) lets the guests get entertained in a comfortable and modern atmosphere. Located close to the Snack Restaurant, all the guests get to enjoy the Games Land with arcade and electronic games, PlayStation and Internet Café. 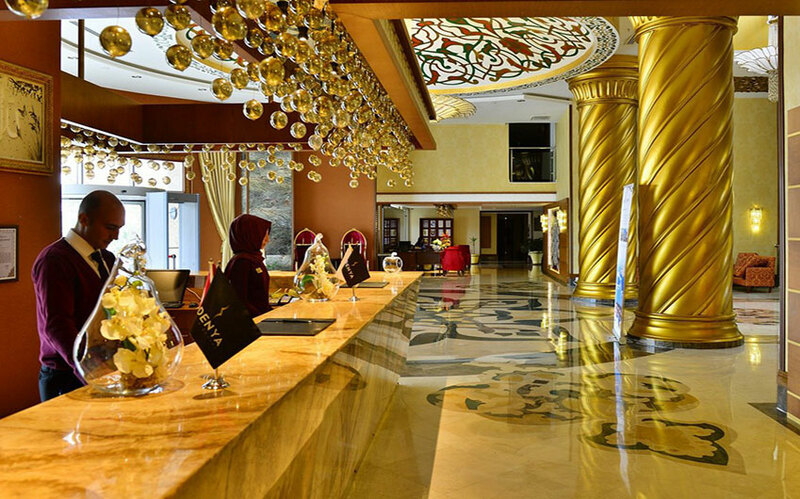 All food that is served within the premises of hotel is halal and the drinks are alcohol-free. Sedir Restaurant is Adenya’s main restaurant that serves Mediterranean and Ottoman cuisine with its unique and finest flavor. Enjoy open buffet of breakfast, lunch and dinner in a family-friendly atmosphere and spectacular views of the sea. Taş Ev A’la Carte lets you relish the seaside and a fireplace. It has its own special menu featuring amazing recipes. Yelken Snack specializes in serving delicious snacks other than the main meals. Lobby Terrace Café is where you would rejuvenate from the day’s exhaustion. Enjoy a chat with your family and friends over refreshing sips of Turkish coffee. Café Keyf provides a comfy space for families to enjoy time playing games like scrabble, checkers, chess, backgammon etc. Hokkah café is exclusively for those who enjoy smoking in a cozy ambiance and a blend of aromas. Meyden Café serves delicious snacks as well as main meals. If cancelled or modified up to 31 days before check-in date, no fee will be charged. If cancelled or modified up to 16 days before check-in date, 40% of price will be charged. If cancelled or modified up to 8 days before check-in date, 50% of price will be charged. 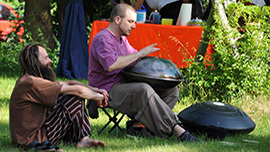 Summer season daytime activities and evening entertainment usually includes games, sports, competitions, shows, live folk music, poetry, comedy plays, etc. Other activities: Parachute, Surfing, Jet Ski, etc (at extra charge). Please confirm if any requirements. Alanya is one of the most stunning places situated near the Mediterranean Sea and facing the Torus Mountains. 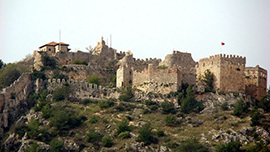 This has been the core center of countless civilizations for hundreds of years and served as a citadel for the empires of Seljuk, Roman, Byzantine and Ottoman. At a drive of 2 hours from the main airport, Alanya commences to create its impression through a multitude of natural and historical charms. 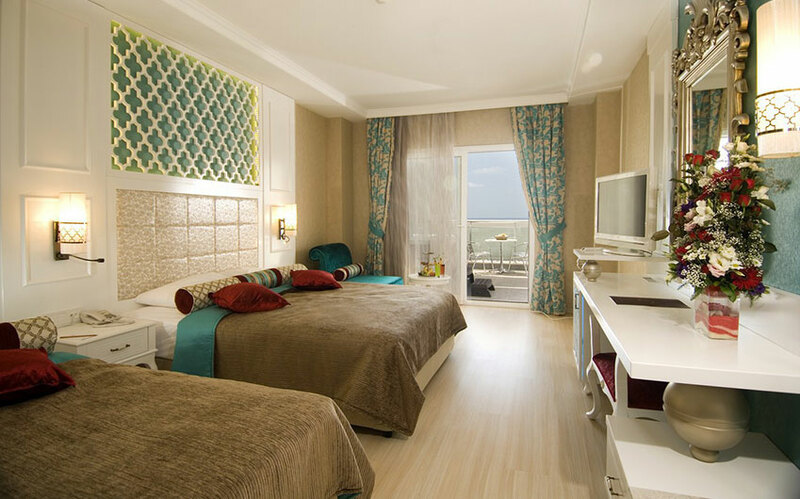 The foundation of the first hotel in 1958 started the tourism era for this gorgeous beach resort city and since then the tourism companies and the hoteliers have been in the sprint of creating ever new and lavish selections to attract the tourists. Not only the historic monuments but also the natural beauty of the deep blue sea spreading alongside the coast would make you extend your trip in this splendid city. 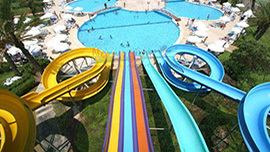 Your holiday would be incomplete if you don’t get a dip in the wave pool at this Aqua Park. Dedicate your day to fun and recreate your adventurous side by bungee jumping and winding down through 24 different slides. 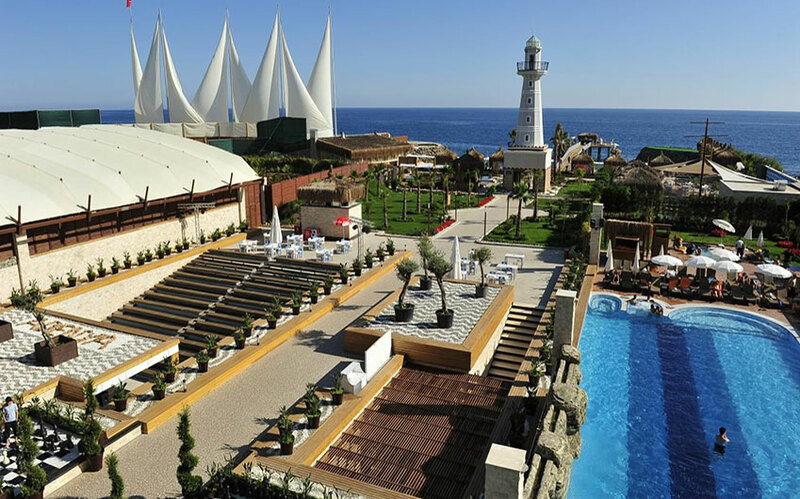 Located on the west side of the Alanya Castle and named after the Queen Cleopatra of Egypt, this beach is loaded with activities and relaxation at the same time. The completely enclosed beach is really an incredible spot having the fine granules of white sand that took millions of years to form. Walk barefoot on the beach and experience invaluable tranquility. To leave behind every grain of this white sand, there are compulsory showers on both verges of the beach. Set out with your friends at 10 in the morning to reach Rıhtım Caddesi from where the boats leave for a six-hour excursion. Traversing through the caves and passing the Cleopatra Beach confront the scenic beauty of the Turkish Riviera and dive in the refreshing sea near the Phosphorous cave. Whether you want to swim or relax or just breathe the air around the turquoise waters, a full day boat excursion is totally worth your time and one of the top things to do in Alanya. The best way to enjoy the countryside of Alanya is through the thrilling adventure of jeep safari. Get acquainted with the village life of Turkey and stop by to pray at the old mosque there, this safari is impeccable for those who wish to flee the Mediterranean heat and experience Alanya in a new and different way. The 4x4 jeep will take you through the scenic dense pine forests as well as the dingy tracks. Enjoy a stopover for lunch and jump into the glistening water in the end to wash away the dust. This thrilling adventure is a must to enjoy with your family. Give your vacation a chance of this new adrenaline-pumping adventure on the Köprüçay River of the Köprülü Canyon. Make your bookings with the help of your tour guide and get ready to raft fully equipped. The professional guides would be there to assist you and therefore no experience is required to enjoy the rafting. During summer as many as 7000 people can raft at the same time. Multiple events in Alanya, flattering every taste and uplifting every age, welcome the contestants from all around the world to indulge into the activities amidst the landscapes and historic appeals of the city. 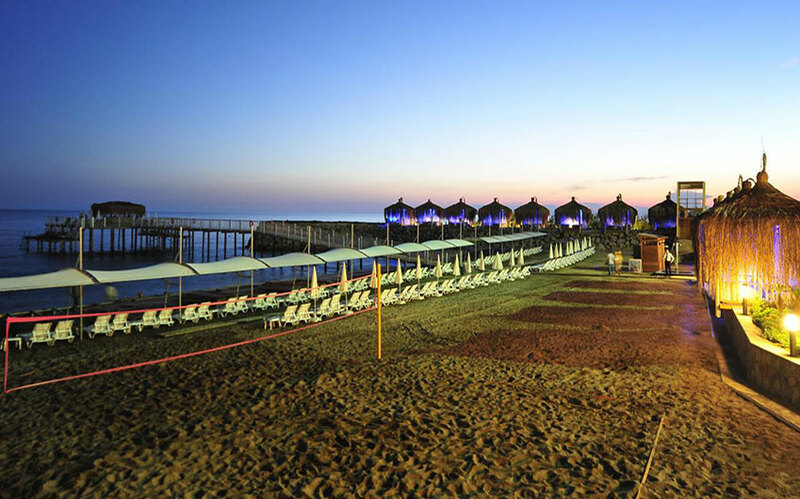 At the Cleopatra Beach, sports get unified with the natural beauty where European Beach Volleyball Tournament is held and fill the locals as well as the tourists with enthusiasm. Annual European Triathlon Championship, Turkey Regional Beach Soccer League, Alanya Tennis Tournament and International Handball Festival are the major sport events held in Alanya. The Southern Mediterranean town of Alanaya dedicates the last Saturday and Sunday of May to celebrate art and culture. This festival engages the tourists and becomes a source of bonding with the neighboring cities. One of the invited sister cities entertains the audience with their specialty. Previous few years have been quite a highlight with the Polish orchestras and Latvian oil painters while Alanya amuses with its folk dances. Alanya Wood Sculpture Symposium is an amazing exhibit in the city for art lovers while the fans of music would love to get entertained at the Alanya Jazz Festival. This superb tourist spot always yearns to serve its visitors with the best of attractions to make the holiday worthwhile. The warm hospitality of the city never falls short to make your stay unforgettable. Known as “the town where the sun smiles” or “paradise on earth”, this city with the brightest of blue colours would captivate you with its scenic beaches, wonderful palm trees and a wealth of history. 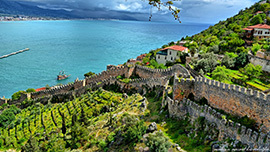 The historical gems that are a must-see for every visitor include Alanya Castle with a heighted wall of 250 meters and 83 towers. This castle dates back to the 13th century to the time of Seljuk and it still holds a vital position as a center of various activities. The Seljuks erected an octagonal structure of the Red Tower in 13th century with the purpose of guarding the harbor. In the present day it serves as the Museum of Ethnography. The history-lovers must visit the Archaeological Museum for it unveils the antiquities from different eras. Akshebe Mosque and Tomb,Suleymaniye Mosque, the Citadel Church, Alara Han and Castle are some additional must-see places of Alanya,momentous for their historic and architectural feel.